Protestors gathered outside the London office of G4S on Friday to highlight the private security firm’s role in incarcerating Palestinian prisoners on behalf of Israel. Organizers demanded the release of several prisoners, including Palestinian MP Khalida Jarrar and more than a hundred child detainees. They also highlighted the ill treatment of prisoners, including alleged incidents of torture. The protest in London takes place as part of an international day of action to mark Palestinian Prisoners Day, an annual expression of solidarity with Palestinians detained by Israel. 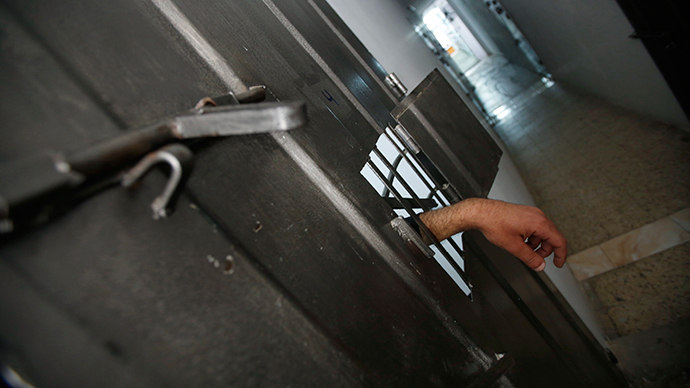 Palestinian Prisoners Day began as a mass action in support of hunger striking political prisoners on April 17, 2012. It has grown into an annual event marked by human rights organizations and pro-Palestine groups across the world. More than 100 people confirmed they would attend the protest on its Facebook page. Organized by Innovative Minds (Inminds), a group which describes itself as online Islamic activists, the demonstration targeted G4S for its operation of two prisons and two detention centers in Israel and one prison in the West Bank. Some 6,000 Palestinians are currently held in Israeli prisoners, according to the Addameer Prisoner Support and Human Rights Association. Addameer’s monthly detention report for February 2015 indicates 163 of these prisoners are children, 13 of whom are under 16. The vast majority of those incarcerated are male, with only 22 female prisoners. Lina Jarbouni, a female detainee from Galilee, is the longest serving female prisoner having been in jail for 13 consecutive years. “Systematic torture and ill treatment” of Palestinian prisoners is well documented, according to human rights group War on Want. Activists say G4S is complicit in this ill treatment by providing security systems for the Israel-based Ketziot and Megiddo prisons, which hold political prisoners arrested within Palestine. War on Want claims G4S has acted in violation of Article 76 of the Fourth Geneva Convention, which prohibits the transfer of prisoners from an occupied territory to the territory of the occupier. G4S has become the target of an international boycott, with the South African government resolving to end work contracts with the security firm in November last year. Archbishop Desmond Tutu was one of several notable activists, including Noam Chomsky, to sign a petition calling for G4S to end its participation in Israel’s occupation of Palestine. Protestors outside the London office of G4S highlighted the plight of Palestinian prisoners being held by Israel as well as those detained by the security firm. They demanded the release of Palestinian MP Khalida Jarrar, who was arrested by the Israel Defense Force (IDF) earlier this month. The prominent feminist and human rights activist was sentenced to six months in prison without trial for violating a military injunction, which confines her to the city of Jericho and its surrounding. A spokesperson for the Palestine Liberation Organization (PLO) said Jarrar was heavily involved in the Palestinian Authority’s bid to join the International Criminal Court (ICC). Activists also demanded justice for Jaafar Awad, 22, a Palestinian man who died from health complications resulting from “medical negligence” during his detention in an Israeli prison, according to the Palestinian Prisoner Society. Another key theme of the protest was the detention of children. Defense for Children International (DCI) launched an urgent appeal in 2012 after documenting 53 cases in which children were held in solitary confinement at the Al Jalame and Petah Tikva interrogation centers, and Hasharon prison. Children reported being held in solitary confinement in a “foul smelling” cell measuring approximately 2 meters by 3 for an average of 10 days. DCI reports no education is provided to them and they are denied access to their parents or lawyers while held in the Israeli Prison Service (IPS) controlled detention centers.